Best-selling author Rosemary Gladstar, long known for her outstanding recipes, now customizes her expertise for men. Dozens of delicious and simple formulas address men's most common health concerns -- including sexual vitality, prostate well-being, and heart health. An A-to-Z compendium of these ailments details how to effectively treat them using a variety of safe and easy natural remedies. 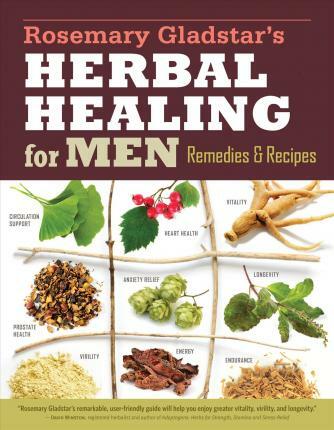 In-depth profiles of 29 herbs explain how men will benefit from each and suggest uses and accessible preparation tips. This handy guidebook for men -- and the women who love them -- provides a helpful introduction to this crucial, but often-overlooked, aspect of natural wellness. Increase your energy and vitality with this holistic herbal approach to men's wellness. Renowned herbalist Rosemary Gladstar tailors her expertise to address men's most pressing health concerns, including impotence, heart health, blood pressure, prostate health, and depression. In-depth profiles of 30 herbs explain how to effectively use each to combat ailments both chronic and acute. Diet and lifestyle tips will help you establish healthy long-term habits, while 51 recipes for tonics, salves, sweets, and more guide you in becoming a more active participant in your own health care. 51 simple, tasty, and effective recipes include Fire Cider, Damiana Love Liqueur, Energy Balls, Feverfew-Lavender Migraine Formula, Long Life Elixir, Super Maca Milk Shake, Hawthorn Heart Tonic Honey, and Antifungal Foot Bath.